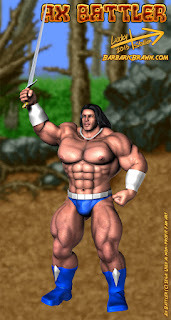 Golden Axe is one of my old favorites from my childhood. Ax Battler is a studly barbarian on a quest to destroy the evil Death Adder and prevent him from conquering the world with the power of the Golden Axe. It was only a matter of time before I tried my hand at a model of Ax, but I just didn't think what I made was good enough to attempt anything with, so I kept him in one of my many art folders for later on. This was early in 2013. A while later, after I had learned some new techniques in lighting, I went back and refreshed his model a little and version 2 is what he looked like after. I'm still not very happy with it. I made the belt from scratch and the necklace and diamond spikes on his boots are mine, also. I had planned on making Death Adder's helmet, but my skills aren't quite at that point yet so he remains uncreated for now. I'll almost assuredly return to the raven-haired stud at some point in the future, but for now, I just wanted to share him with you guys. You're a great artist man! :-D more power to you! Aww yeah. :D Abadede was a very hot boss and one I'd love to tackle someday. Get him with Max for some well-deserved revenge against the hero! Thank ya! Glad you liked it! My name's Raiah. Been a fan for almost 2 years now. Your art is amazing: visually and literarilly speaking. Thanks so much, Raiah. :) I always greatly appreciate the support! So battler, it has been a while, haha. I remember pining over him from the group stories, beaten and held by death adder as his personal slave. Fantastic work! I remember Ax Battler. Growing up he was one of my favorite video game characters. That whole game was packed with manly men. I loved it! Yeah! 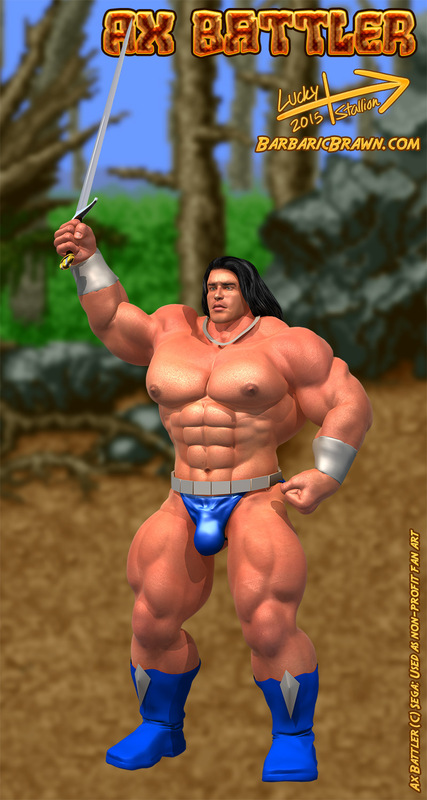 :D I really wish they'd revive it with an emphasis on Ax again, this time, and with all of the loincloth-wearing musclebound men from before. I'd probably be better off making my own knockoff of the series one day. :l I'd be an old stallion by the time they got around to doing it. I've been looking at some indie games they've made; some of them are pretty good. I'll just bet that you'll do something just as good, if not better. Aw, thank ya, man. It's just me mumbling and grumbling about things that probably won't happen. *grin* Would be pretty cool, though. Thank you very much. :) There's always hope they'll revive the series one day (with barbarian and dwarf back as playable characters), but just in case it doesn't happen, there's always fan art, thankfully. [Gift Art] Super Macho Man!